to maintain a healthy lifestyle, to meet a personal challenge, to enjoy the experience of a sports happening, or simply for the sake of having fun. 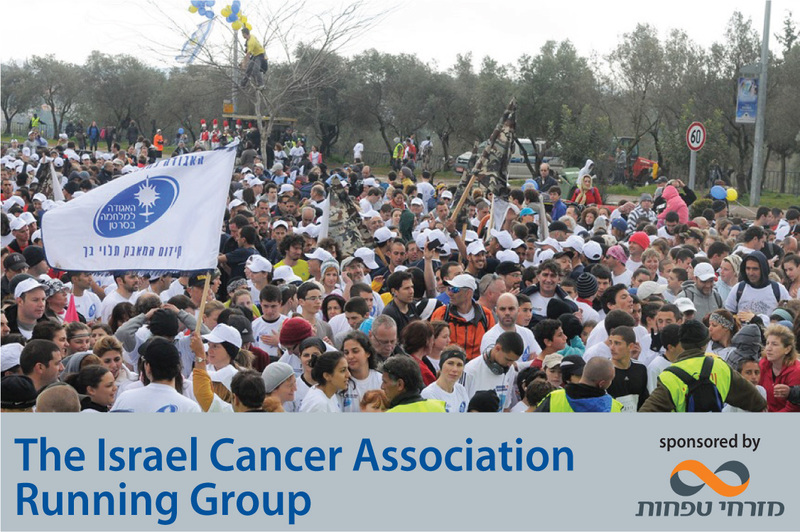 The Israel Cancer Association suggests that you enhance your experience and incorporate charitable giving into your sports activity, so that, together, we can achieve several aims: heightening cancer prevention awareness, enhancing patients' and survivors' quality of life, and supporting research to eventually close in on a cure. The Fourth Annual Jerusalem Marathon is scheduled to take place on Friday, 21 March 2014, and the Israel Cancer Association invites you to make your running experience a more meaningful one. Please give a few minutes of your time and open a personal fundraising page, featuring a personal message, photo or clip as well as your fundraising target. Share the page with your friends, acquaintances and relatives, who will support the challenge you have taken on – finishing the race and raising your target sum. Your donation helps enhance the lives of cancer patients and their families and also assists in financing research studies that will help us find a cure for the disease. Running for the Fight Against Cancer is the Israel Cancer Association's fundraising campaign in conjunction with the Jerusalem Marathon. We invite you, runners of all ages, and all fitness levels, to set yourself a personal challenge: to finish one of the Jerusalem Marathon race courses, scheduled to take place on 21 March 2014, and do something good along the way. Using this link, you may set up and design a personal fundraising page on the campaign website. On your fundraising page, you can post a photo, video clip and personal message calling upon family and friends or acquaintances to support you in the challenge that you have taken on and contribute to the fight against cancer. What should your target be? a. Preparing for a race in the Jerusalem Marathon and b. Raising a donation – which can make a real change in the quality of life of cancer patients, lead to breakthrough scientific research or help purchase life-saving medical equipment. By enlisting the support of people in your social circle, you can benefit from a virtual fan club for this campaign and add an element of commitment and meaning to your training regimen. Moreover, the Running for the Fight Against Cancer team will see to a training program, informational materials, and moral support. Our 576 donors and supporters made this campaign a success in 151 days. עמית לכושר - צוות רעות מכבים ..
אגודת הסטודטים של הבינתחומי ..